Is animals coming out of their enclosures a rarity or a general occurrence ! Human mind tends to compare – and nearly identical instances expect identical handling… World over there are Zoological parks housing animals, some in their natural habitats, frequented by people. Children enjoy seeing animals, so do most of us. The Franklin Park Zoo is a 72-acre zoo located in Boston, Massachusetts, currently operated by Zoo New England, which also operates the Stone Zoo in Stoneham, Massachusetts. The zoo is nearly 100 years old and is accredited by the Association of Zoos and Aquariums (AZA) since 1990. The facility is funded by state money, and has had a history of staff and financial problems. It was a case of Zebra – a 900-pound endangered Grevy’s zebra, escaped her enclosure in chase of her foal at the Franklin Park Zoo recently and pranced freely around for more than an hour, forcing the evacuation and temporary closure of the zoo as workers tried to corral her back into custody. The striped ones of horse family are not known to be dangerous ! – this great escape also resulted in no injuries but only caused some more excitement in the park. The foal, in equine protest of her first day in the exhibit since her birth was the first to escape by breaking through the fence and prancing around for a while. 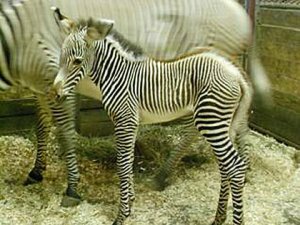 Authorities said that the 100-pound foal, who has not been named yet, somehow broke through the cable and wire fencing at the exhibit – where her mother, Evita, 16, and another zebra had been staying. Evita then followed the foal, apparently to protect her. The foal returned on her own and was able to make it back into the exhibit about 40 minutes after the escape. But the mother zebra did not return to the exhibit, and continued to gambol about the zoo. Officials had to use a tranquilizer to contain her. She was placed in a trailer for a while before being brought back to the zebra barn. About 1,000 people were evacuated during the incident. The zebras were also not harmed. Though it was attributed to any human error, an investigation was ordered into the incident as this reportedly was not the first escape. In 2003, a 300-pound gorilla named Little Joe escaped from his enclosure on two occasions, and on one of them he attacked a 2-year-old girl and an off-duty zoo employee, leading authorities on a massive chase through darkened woods and along a nearby street until his capture two hours later. 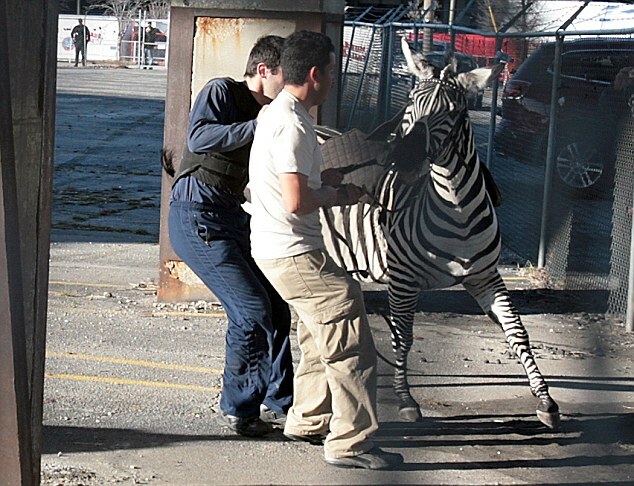 The incident triggered major security upgrades at the zoo. Officials said they have kept zebras and their offspring without incident since 1999. Arising out of the Zebra gambol, the zoo was closed for several hours which frustrated the visitors who had come. Subsequently they were allowed in though the zebra exhibit will be closed for the next few days while zoo staff members rework the pen to make it more secure. I had posted one recently about the slithering scare at the Vandalur zoo in Chennai, Tamilnadu. A nine-foot Burmese python, which escaped from its enclosure a week ago, is playing hide and seek with the zoo staff, giving many visitors the jitters – there are no reports of it being caught as yet. It was reported that a seven-year-old boy visiting the zoo spotted the reptile in the open a couple of days ago and his father informed the zoo officials. It was not news to them, since they knew a week ago that the serpent had escaped from its enclosure through a drain that had been left uncovered by the staff after cleaning. It is stated that not to scare away visitors, the zoo did not put up a notice. “The python is out there somewhere,” said a zoo official. “But don’t worry, pythons are not poisonous.” The Zoo officials claimed that this was the first time that a snake has escaped since its set up in 1989 and that they would soon get the snake. Ironically, the python has been seen by visitors but not by zoo staff. With many children visiting the zoo, it certainly does not sound safe. Pythons are known to gobble up birds and small mammals and can crush a human being to death. The python uses its sharp teeth to seize the prey, then wraps its body around it and, contracting its muscles, kills it by constriction. A harmful python escapade known to Authorities but still no signs to warn the visitors but elsewhere a zebra escapade makes them close the zoo and even after it was captured and put back, they try to make it more secure !! If it smacked callousness, some more reading of Nov 2007 news makes it more so worrying.. at that time a reticulated python was found inside the pygmy hippopotamus enclosure. The reptile measured about 13 ft and was found active and in a healthy condition. According to Zoo officials, it was noticed by an animal keeper who went to clean the pygmy hippo enclosure. One of the zoo officials was quoted as saying that the rescued python could have escaped from its enclosure, when it was young. “We were not able to clearly say when it escaped. We suspect that it could have sneaked out four to five years ago.” When the workers were trying to take the reptile, it bit one of the animal keepers. “It was very ferocious” when it was rescued, the authorities said. The reptile was feeding on small mammals, roaming freely inside the zoo, which helped it survive without any problem.